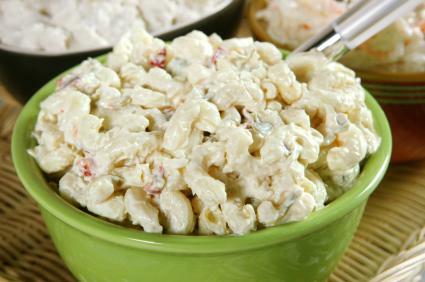 Delicious macaroni salad recipes come in many forms and flavors, from the basic American picnic version to more elaborate versions that include diced ham, bay shrimp, or anything else that happens to be loitering in your refrigerator. Pasta can be found in many shapes, sizes, and colors with unique names based on its shape and size. Usually, the term macaroni refers to elbow macaroni, a small tube of pasta that is curled and cut in a semi-circle. Elbow macaroni is most commonly used to make macaroni and cheese or macaroni salad, although it is a welcome addition to soups or stews as well as desserts. Macaroni is most useful in these dishes because of its size: it fits well on a fork and doesn't need to be wound. Because it's a tube, the sauce can sneak inside, filling the pasta with flavor. The shape of the macaroni also compacts well, giving you a firm salad or casserole. Pasta expands when it is cooked. For some forms of pasta, this is more noticeable than for others. When spaghetti is cooked, the expansion is barely perceptible, but when elbow macaroni is cooked, the size difference can be readily noted. This is why recipes formulated to feed four will call for one cup of uncooked pasta. This is good to note because it will help in increasing or decreasing the amount of needed pasta. If you need to make enough macaroni salad for six people, use a cup and a half of uncooked pasta. The math is easy. It is the dressing or sauce that will make your salad delicious. Macaroni salad recipes vary on what the dressing consists of but, unless you are making a vegan macaroni salad, the base for the dressing will be mayonnaise. Where you go from there is up to you. First, you will have to make the pasta. Macaroni likes to cook in a lot of water--the more water you use the better end result you will have. For one cup of macaroni, use at least two quarts of water. This may seem like a lot of water, but keep in mind that the pasta will absorb a good amount of the water. One cup of uncooked macaroni will give you four cups, or one quart, of cooked macaroni. So be generous with the water. Also, be generous with the salt. The only time to season pasta is while it is cooking. If you haven't seasoned the water enough, you will end up with bland pasta and this will affect the flavor of your salad. Adding enough salt to the water will make the difference between bland and delicious macaroni salad recipes. Bring a minimum of two quarts of water to a boil. Add at least 2 tablespoons of salt. Boil the pasta according to the directions on the box; about 7 minutes should do it. You want the pasta to be al dente. Once the macaroni is fully cooked, drain it and rinse it under cold water to cool it as quickly as possible. Transfer the pasta to a bowl and let it rest in your refrigerator for at least an hour to chill completely. While the pasta is cooling, mix together the mayonnaise, mustard, salt, pepper, bell peppers, onion, celery, and grated carrots. Mix the dressing and the pasta well and return the salad to the refrigerator until you are ready to serve it. If you like, you can garnish the top of the salad with some grated carrots. For a different flavor, you can add ¼ cup of apple cider vinegar and 2/3 cup of sugar to the dressing. You may also want to add chopped pimentos or sweet relish. Other additions to the basic macaroni salad include chopped black olive, diced roasted chicken, diced hard boiled eggs, or diced tomatoes. If you replace the mayonnaise with soy yogurt, this becomes a vegetarian friendly salad.